TITLE OF THE PAPER: TIMES NEW ROMAN, FONT SIZE 12, CENTERED, AND BOLD. Please read carefully all information given in this section before typing. Please use the Times New Roman style with font size 9. The paper’s title must be between 40 to 100 characters length. The abstract must contain: "Thesus (problem statement), Approach, Results and Conclusions.” Please use this document as a template. Attach a Doc and .PDF format in the final submission. Visit the website for any updates. Please double check that the font is size 10 throughout the paper, excluding the title, which is to be 14 font size. Keywords: Four or Five Keywords (First Characters of Each Word are in Capitals/Uppercase Letters) and Italicized. The paper size should be 210mm X 297mm on A4 paper. Please save this in the MS Word templates directory. Use 9 point Times New Roman font. Single line spacing is mandatory. Try to avoid underlining or bolding within the text. A font size of 10 or larger should be kept throughout the paper, including text inside figures and tables. The top margin should be 30mm while the left, right, and bottom margins should be 25 mm. Headings and numbering should be aligned to the left. Leave one line between headings and the first paragraph and no spaces before succeeding paragraphs. Indent the first line of the paragraph by 5mm. All text should be aligned to the left and right. Footnotes and underlining are not allowed. At most, use three levels of headings that correspond to chapters, sections, and subsections. The first level headings for chapter titles should be in 10pt, bold, justified, and capitalized font. Leave one blank line before and after the first level headings, respectively. Second level headings should be in 10pt, bold, justified, and capitalized font. Leave one blank line both before and after the heading, respectively. Third level headings should be in 10 pt, italics, and sentence case. Insert one blank line before and after the headings. The further lower level headings should be avoided. Figures or tables should be sized the entire width of a column, as shown in Table 1 or Fig.1 (Figs.1 and/to n,) or the entire width of two columns. Do not place any text beside the figures or tables. Do not place them all at the end of the manuscript. Table numbers and labels should be placed on top of the table; hanging by 12.5 mm, and left and right-aligned. Number the tables consecutively and place them closely after where they are first referenced. Leave at least one line between the table, label, and the text. Tables should be auto-fitted to window and no vertical lines or borders are needed. Items should be placed under the respective table, leaving no space between the two; 10-pt font; and left and right-aligned. Figure numbers and labels should be placed one line under the figure, hanging by 12.5 mm, and left and right-aligned. Number figures consecutively in the order in which respective reference is first made in the text. Place figures after and close to where they are first referenced. Please do not compress the figure (images of 600 dpi resolution or more are preferable.) Draw figures clearly and embed text in the image properly. Do not cut and paste from another text. Ensure that after printing, the images are clear and readable. Do not use an outer boundary. Equations and symbols should be typed in the equation editor. Number equations consecutively with equation numbers in parentheses. Please get a native English-speaking colleague to proofread your paper if your native language is not English. The parenthesis-enclosed equation number should be aligned to the right. Symbols and notation should be defined when they first appear. Use one blank line before and after equations. You may use colored figures and photographs in your paper. These will appear in color on the online version of the journal. However, please check that your colored figures are legible when printed in monochrome (black and white), as this is the way they will be reproduced in the hardcopy version of the journal. · References from journals example: (Smith, 1987a). Journal names may be abbreviated by following "The International List of Periodical Title Word Abbreviations." If unsure, write names in full. · References from books example: (Large et al., 2009). · References from other literature examples: (Legat, 2006) and (Pfeifer et al., 2007). · References from websites example: (Johansson, 2002). It is important that the pattern described in this section is followed through the entire paper. 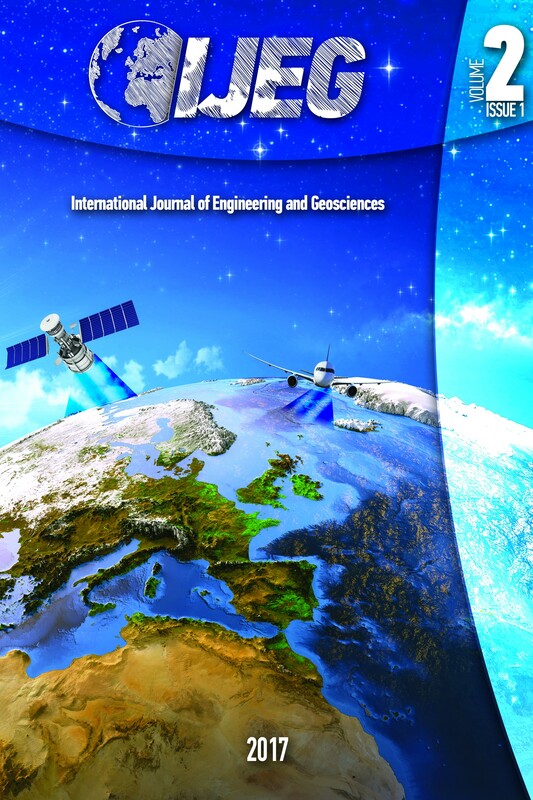 Please inform others to publish their works with the International Journal of Engineering and Geosciences (IJEG). Selected papers from the IJEG Conference presentations will be reprinted in the journal with nominal charges based on author agreement. Accepted papers that were not presented in the IJEG Conference will incur a publication charge following the paper submission guidelines. Smith, J., 1987a. Close range photogrammetry for analyzing distressed trees. Photogrammetria, 42(1), pp. 47-56. Smith, J., 1987b. Economic printing of color orthophotos. Report KRL-01234, Kennedy Research Laboratories, Arlington, VA, USA. Copyright © International Journal of Engineering and Geosciences (IJEG). All rights reserved, including the making of copies unless permission is obtained from the copyright proprietors.